In Range Contacts redefines peer-to-peer professional networking. Locational-networking app, In Range Contacts, is now available for download on iPhone and Android devices via the Apple App Store and Google Play. 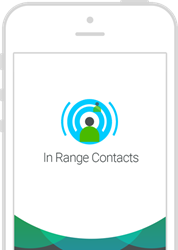 In Range Contacts is a safe and secure way to network with contacts near you while traveling, attending conferences, or even enjoying sporting events. Location privacy is an important part of the app and provides all the advantages of location-based functionality without the intrusion of maps, pins, or real-time tracking of a user’s whereabouts. The app is also designed to help parents learn their children got to their destinations in a non-invasive, discreet way. In Range Contacts also features a specialized opt-in system, where users receive a simple, text-based notification when a person is within a range they have set. Never miss an opportunity to connect and engage with your contacts again. With individualized contact customization, users can see contact details, customize distances, and choose what alerts you want to receive on a per-contact basis, allowing for total control over how and when In Range Contacts notifies you and your contacts. The app’s seamless integration with your existing contacts on your mobile device makes it easy to invite your contacts to join In Range Contacts. In Range Contacts is designed to protect your privacy. It never stores or maps your location or the location of your contacts. You control how and when In Range Contacts alerts others to your presence or their presence to you. You can download In Range Contacts from the Apple App Store or Google Play. For more information about the platform, visit http://www.inrangecontacts.com. In Range Contacts was developed by Zco Corporation, one of the largest app developers in the world. True North i.p. is dedicated to making investments that enhance and improve the way people connect. Their new app, In Range Contacts, harnesses the power of location services and contact integration to efficiently connect people with their personal networks. Zco Corporation is one of the largest custom developers in the world. Founded in 1989 and headquartered in Nashua, New Hampshire, Zco has served Fortune 100 companies to small businesses for over 20 years. Its services include mobile and enterprise app development, 3D animation and games, augmented reality, and custom software. To learn more, visit http://www.zco.com. If you are interested in more information about In Range Contacts, please contact Kyle Mallinger at kyle.mallinger(at)zco.com.